When going through a sports or shoe store, you will generally find yourself overwhelmed by the many shoe choices. You walk up to the shoes and can’t decide which to choose – they all look the same. You may pick a pair that seems to be the best option, but do you know anything about it? Is it a running shoe or walking shoe? You need to know the answer to that question before making your purchase because you need a shoe that fits the exercise you are doing. What’s the difference? This blog is going explore how walking and running shoes are different, helping you choose the best shoe for you. When we run or walk, we use our feet differently, and our body weight is spread out in a different manner. When you run, the impact of hitting the ground with your feet is three times the amount of your body weight – sounds painful, doesn’t it? Runners need quite a bit of cushioning in their shoes, especially at the front of the foot and the heel, but walkers only need slight cushioning. If a walker purchases a running shoe with much cushioning, he or she will notice more foot fatigue because the extra cushioning adds extra weight. If you plan on running, purchase shoes with decent cushioning, if you are walking, purchase shoes that only have minimal cushioning. Take a close look at walking and running shoes – do you notice how the running shoes have built up heels, and the walking shoes hardly have any? This is because when running, we tend to strike with our heels or midway on our feet, meaning we need a higher, built in heel in our running shoes. Sometimes, we might hit with the balls of our feet, which means we need less of a heel in our running shoes, but we still will need one. When you are using walking shoes, you should look for one the smallest difference between the toe and heel to ensure you get the best shoe. You don’t need as much shock absorption when walking as you do when running. 3. Flared And Not Flared Shoes? Again, take a close look at walking and running shoes, but this time make sure you are looking from above. Do you notice how the heel of the running shoe has a flare and the walking shoe does not? That flare helps give runners more support, as they will need a wider heel so that they do not roll their ankles when running. You mainly see these flares in running shoes that are for trail running. If you are looking for walking shoes, make sure you find some that do not have that flare. Because you strike your heel when you are walking and roll forward to the ball of your foot, the flared shoe will keep you from doing this. This can cause significant pain when walking with shoes that are only for running, not walking. Always make sure that you choose the best walking and running shoes, depending on how you plan to workout. You can find a number of great walking shoes here at The Orthotic Shop, as well as some incredible running shoes. Take a look around and purchase some wonderful walking and running shoes for yourself, today! OluKai designs their sandals and shoes for comfort! Inspired by the Hawaiian Islands, OluKai translates into OLU: Comfort and KAI: Ocean. The Spirit of the brand is embraced in those two Hawaiian words. OluKai footwear consists of high quality materials, bio-mechanical arch support, cradling heel cups, and wider toe areas. The shoes have thicker removable insoles so you can use custom orthotics if you wish. OluKai’s stock insoles are very comfortable. As an avid fan of orthotics, I find that I can just wear the shoes with the insoles they come with and not experience any arch/heel pain. Olukai Shoes & Sandals feature an anatomical arch support which improves comfort & supports the natural contours of the foot. Proper medial and lateral arch support reduces aches and pains, and promotes healthier functioning for superior natural shock absorption and a coiled spring effect in the foot. Great for all but especially people with Plantar Fasciitis arch & heel pain. Olukai Shoes & Sandals offer generous toe boxes to allow your toes to spread naturally, like a bare foot in wet sand. The result is better balance, less stress, and increased comfort. Great for people with bunions or hammertoes & also to prevent such ailments. Olukai Shoes & Sandals heel cup cradles the foot, minimizes side-to-side movement, and provides stability & natural shock absorption. The heel cup centers & aligns the foot to minimize pronation and supination, reduce pressure on the arch, and enhance the body’s natural cushioning and bone protection. Great for people with heel pain. We sell a lot of Orthaheel Sandals but sometimes people think there is too much orthotic arch support in those. OluKai is great for those customers as OluKai relies more on cushioning (in the ‘Ohana Sandal) for comfort – their arch support is also not as high as Orthaheel’s. The Office staff at the Orthotic Shop love the trendy styles that OluKai provides as well as the comfort. One of our staff members says the Olukai ‘Ohana women’s sandal feels like wearing a slipper. I used to wear the Orthaheel Bryce Sandal everywhere, which is an awesome sandal, but it got dirty on a fishing trip so I tried on a pair of OluKai ‘Ohana Men’s sandals and haven’t taken them off since. I actually have 2 different colors of them and rotate my sandal use between them and the Orthaheel Bryce’s! Bottom Line: Both Brands make awesome sandals. If you need a sandal that provides more orthotic support, get Orthaheel. If you find their support is too much, get OluKai. 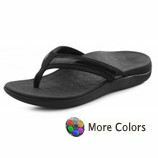 In general, people who wear custom orthotics will probably like Orthaheel more, those in the market for an awesome pair of comfy sandals will probably like OluKai’s materials and styling more. My wife doesn’t need orthotics but seems to wear her Orthaheel Tide’s more than OluKai. This is probably because she has every color of the Tide and only a couple pair of OluKai’s! Your decision on which to get may just be a matter of personal preference. Either way, you’ll be happy, if not we have free return shipping! The Orthotic Shop is expanding our OluKai offering everyday and strives to provide our customers the best selection. All of our staff members have a pair of OluKai Sandals and are very knowledgeable when comparing them to other sandals. We offer Free Return Shipping and Free 2-3 day shipping on items we currently have in inventory. If you have any questions, call us at 800-309-0412, start a live chat with us, or shoot us an email. See the entire Orthaheel Orthotic Footwear Collection at the Orthotic Shop to find out more about Orthaheel!